Since the official launch of the game, no one has been able to ignore the multiple problems of servers, connection, reboot, lag and even less the rollbacks of the death that sends you suicide in a pack of mob without you have not asked anyone... In short, Sandbox Interactive has trouble managing the influx of players on its game and therefore seeks solutions to remedy this problem that directly impacts ingame players. Recently, like almost all the MMORPGs with an online currency, Albion Online suffers the detestable presence of Gold farmers and sellers. To stop this problem, Albion has now banned the exchange of gold between players. What made them rage more, indeed, the reaction of these sellers / farmers was not long in coming. 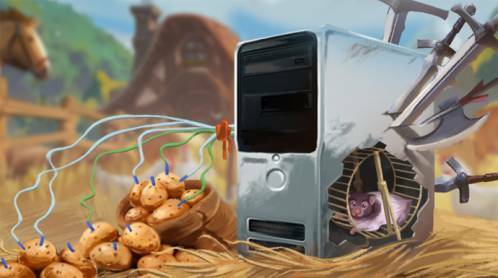 DDOS attacks have been launched against Albion Online servers, DDOS attacks that disrupt the stability of the game, and thus put players in a delicate situation: play or not play? Because even if we understand the motivations that push Sandbox to stand up to these disruptors and to refuse them the ransom they ask to release the waiters taken hostage, we also want to play and enjoy what we paid for. Hearing the complaints and anger of his players, Sandbox offers two compensations. One being for players who have played since the official launch, and having suffered server concerns due to Sandbox this time. And regarding DDOS worries, as Sandbox will not respond to any claims from Gold sellers, players will also receive compensation. In short, this means that you will receive in total 14 days of Premium offered in compensation, if you are on the game since its launch. These rewards will be sent automatically during the maintenance on August 12th and should therefore come to cumulate to your total of Premium already active. We await your reactions in comment, do you find that this compensation is sufficient? If you need silver or power leveling in game recently, you will want to join in our activity to get the 3% off code and buy cheapest albion online silver on UpAlbion.